HP recently established a new category in videoconferencing by shedding light on their HP SkyRoom, where it is touted to be an affordable, high-definition videoconferencing software which will offer live, real-time collaboration for instant face-to-face meetings. All this without having to fork out a single cent for subscription fees? Sounds like a dream, eh? The HP SkyRoom will be based on breakthrough video and image communication technology that was developed in HP Labs, where elements of this technology has already seen action in NASA’s Mars rovers which transferred high-resolution images back to earth from the Red Planet with huge success. The HP SkyRoom is touted to be the only videoconferencing tool that can offer real-time collaboration for up to four people over a standard business network, costing the company a mere $149 which is much less compared to a round-trip airfare from San Francisco to Los Angeles. HP SkyRoom will soon be part and parcel on selected HP business desktop and mobile workstations, and even better news for organizations that are looking for means and ways to cut cost – the SkyRoom will be free for a trial period on a fair number of upcoming HP premium business PCs and notebooks as well. If you happen to own workstations or PCs from other manufacturers such as Dell, Lenovo or Sun, fret not – HP SkyRoom is compatible on those platforms as long as they meet minimum technology requirements. The breakthrough innovation behind HP SkyRoom is derived from the merging of high-definition, multiuser videoconferencing and a sophisticated capability that will share display information more securely compared to the actual transfer of data and processing functions. 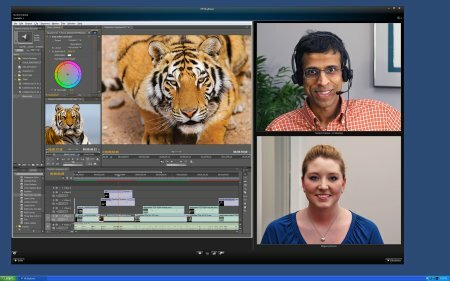 In layman’s terms, the video engine will allow everyone to view the presenter’s display as well as each other without suffering from stuttering frame rates, via a multiway videoconferencing session. The video engine itself is multithreaded in order to take full advantage of today’s multiprocessor and multicore processing technologies. Apart from that, it can also handle 2D and 3D graphics, full-motion video and multidisplay – even if your system has but a 2D graphics card.